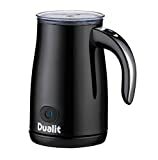 Dualit 2 drink capacity - Non-stick coating - Sylish looks - Easy clean - Triple function Mid range VIEW PRICE HERE! Andrew James 2 year warranty - 450 watt motor - 300ml capacity - User alert - Pre-set functions Affordable VIEW PRICE HERE! 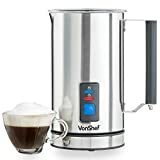 VonShef Premium Quick heating - Non-stick - Stainless steel - Indicator light - Cordless Affordable VIEW PRICE HERE! Classy looks, excellent capacity and a milk heating function, in addition to its frothing capabilities, make The Dualit Frother (VIEW PRICE HERE!) a fabulous purchase for a real coffee lover. A non-stick coating stops the irritation of burnt milk collecting at the base of the jug and the end product is velvety smooth. The 2 milk drink capacity means no one need fight over who gets the first cappuccino! The Dualit milk frother really is a coffee connoisseur’s dream gadget. Sitting at the higher priced end of mid range models this matte black beauty shares many attributes with the audaciously expensive models at the top, making it a fairly sensible investment if justified by everyday use. With its smart yet modest looks and compact design, the Andrew James electric milk frother is a deceptively powerful machine. Within two minutes perfect froth or scalding milk can be yours. 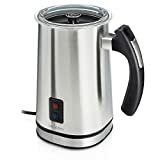 Protected by an automatic two year warranty, this milk frother is a good all rounder ideal for family use by virtue of its milk heating function but equally suited to frothing your daily cappuccino fix. 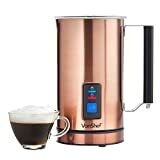 Lashings of hot frothy milk will be delivered in seconds to the lucky owner of a VonShef Premium milk frother. With two attachments – a wire accessory for frothing and a plastic vessel for heating – quick action and a cordless power supply this super efficient machine is a delight. Silicone feet, a heat resistant lid and handle, and automatic switch-off function make this a reassuring choice for a family home. While good looks and speedy action reassure that efficient need no longer equate to dull! Anyone seriously considering buying an automatic milk frother for their own home use is clearly particular about their coffee. Though all three of the options we’ve considered today have their attributes (and each its individual advantages over another depending on the order you prioritise style, safety, speed or ease of use) the VonShef Premium is our cappuccino champion on this occasion. Great design and fast functionality combine with its dual functions and excellent price to make it the machine we would most highly recommend. How quickly many of us have fallen into the role of coffee connoisseur. It wasn’t so long ago that the humble high street cafe was the best place to grab a caffeine fix on the move. Real coffee was a post dinner treat in restaurants fancy enough to present you a chocolate mint on a doily to soften the blow of the bill. Something the cast of Friends drank from oversized cups as they gossiped on sofas, flicking their iconic hair. Or an affectation of the well travelled: once you’ve had genuine Italian coffee it is unthinkable to go back, darling! Unless you are blessed with a full blown professional coffee machine in your kitchen, you will not have access to the wizardry of the steam wand: that magical device which conjures silky froth from milk and air. But all is not lost. Whether your froth budget will only eke to a manual handheld or stretch to an automatic jug which will do everything but pour itself, a cloudy dairy crown can be atop your homemade coffee with a simple click on the purchase bar. Today it is automatic milk frothers we turn our attention to and, if you are able to fund that reach, it is probably the better domestic option. An automatic milk frother, as you might expect, does all the work for you. Pour in your milk (or milk alternative) push a button or two and leave it to make milky magic. In moments you’ll have that cloud topping your cup. Though, unfortunately, the lack of barista means you’ll be left with a jug to wash up!